On August 27th 2015, IGC, Laterite, and IPA hosted the 5th Rwanda Research Roundtable (R3). Hosted at The Office in Kiyovu, with space kindly donated to us by One Acre Fund, the event was well attended by a diverse array of people from government, academia and the social sector. 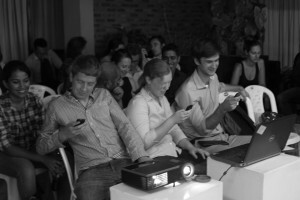 The theme of the evening was cities, with a focus of course on Kigali’s urban development. Why cities? Emerging cities have the potential to be either the greatest drivers of growth or the greatest missed opportunities, for the developing world. As Africa urbanises on an unprecedented scale, we wanted to look at what lessons policymakers can take from research in order to tackle challenges such as land use, transportation, climate change and housing. Fatou Dieye, a Senior Planner with the city of Kigali, kicked off the evening with a fascinating presentation on Kigali’s strategy to address the challenge of affordable housing. She explained how the biggest challenge was not high-end housing projects for the wealthiest citizens or social housing for the poorest, but affordable housing for people in between – the large portion of the population making less than 300,000 RWF per year. All in all, Kigali will need over 400,000 extra housing units between 2012 and 2022. To address this challenge she discussed two current projects that the city is working on – one on affordable housing developments and the other an informal settlement upgrading program. Andrew Sudmant from the Economic of Climate and Smart Cities Research program at the University of Leeds spoke next. He presented the preliminary findings of the work the Leeds team has conducted in Rwanda. Their research aims to establish a baseline, or “business as usual” scenario of energy use and carbon emissions in the city, and then to identify cost-effective ways to bend the curve and promote low carbon development. Interestingly, in Kigali, they find that replacing gas-guzzling motos with an electric alternative could be a promising low-cost way to make a large impact on stemming the growth of carbon emissions. 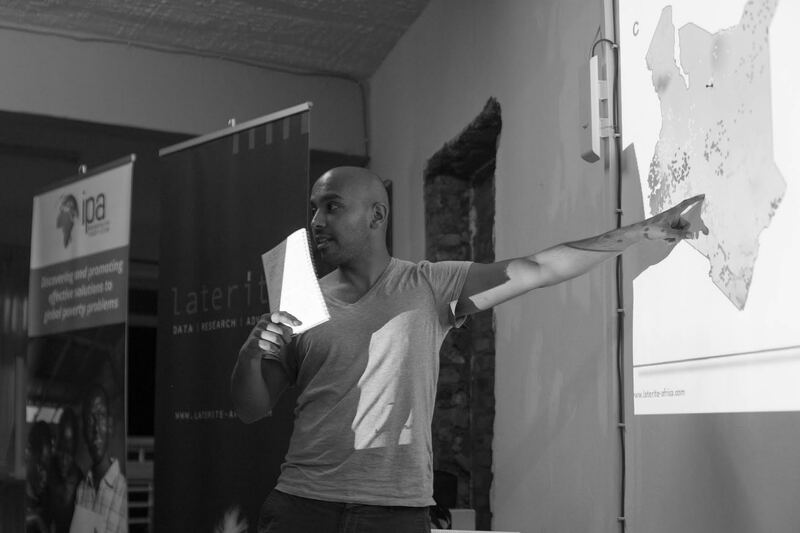 Dimitri Stoelinga and Sachin Gathani, co-founders of Laterite then took the stage to present on three methods of using data to understand better urban development. First, they discussed a project developed by MIT called “Place Pulse” <link> that uses machine learning algorithms to analyse Google Street view images of cities. Second, they discussed possible applications of complexity analysis to understand better the functioning of cities drawing on work they published on export networks in the city of Kigali. Finally, they called up Emily Farbrace, Laterite’s Lab Manager, to demonstrate conTEXT, Laterite’s new mobile survey product. After texting R3 to Laterite’s shortcode, participants in the audience filled out a free short survey via SMS on their experience with city services. Within minutes, Emily was able to present data to the audience on their experiences with power cuts, water cuts, and traffic in the city. This small-scale trial successfully demonstrated the potential power and endless applications of low-cost, easy to implement SMS surveys. Finally, Patrick McSharry, an expert in big data and author of the book “Big Data Revolution” finished off the evening with a summary of his current work in Rwanda. His focus at the moment is on working with a massive dataset on mobile communications from RURA – Rwanda’s utilities regulator. Referencing two studies mentioned in earlier presentations on using mobile data to improve public transportation in Cote d’Ivoire and to map Malaria transmission in Kenya, he invited the audience to provide input on potential ways that mobile data could be put to use in the Rwandan context. Thanks to all those who presented and who came out to enjoy the evening of conversation and collaboration. Please don’t hesitate to get in touch if you or your organisation would like to be involved in future R3 events. The Rwanda Research Roundtable (R3) is an informal and anti-disciplinary forum for researchers, policymakers and practitioners seeking to advance the research agenda in Rwanda. The R3 is organised by Laterite, Innovations for Poverty Action (IPA) and the International Growth Centre (IGC). R3 seeks to enrich the research community in Rwanda by facilitating discussion on relevant issues and by providing a platform to share the latest findings in a manner that is accessible, interesting and not overly curated. We envision R3 to be an informal and intellectually stimulating platform for dialogue between members of the research community and a wide range of stakeholders including researchers, policymakers, business leaders, PhD candidates, civil servants, community leaders, and NGO/development partner representatives.